This article is about the deity in Indian religions. For other uses, see Indra (disambiguation). 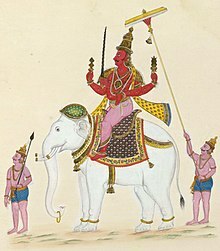 Painting of Indra on his elephant mount, Airavata. Indra (/ˈɪndrə/, Sanskrit: इन्द्र) is a Vedic deity in Hinduism,|url=https://books.google.com/books?id=ouWxrcybsxIC&pg=PA20 |year=1996|publisher=Columbia University Press|isbn=978-0-231-10781-5|pages=20–21}}</ref> a guardian deity (Indā, Pālī) in Buddhism, and the king of the highest heaven called Saudharmakalpa in Jainism. His mythologies and powers are similar to other Indo-European deities such as Jupiter, Perun, Perkūnas, Taranis, Zeus, and Thor. In the Vedas, Indra is the king of Svarga (Heaven) and the Devas. He is the god of the heavens, lightning, thunder, storms, rains, river flows, and war. Indra is the most referred to deity in the Rigveda. He is celebrated for his powers, and the one who kills the great symbolic evil (malevolent type of Asura) named Vritra who obstructs human prosperity and happiness. Indra destroys Vritra and his "deceiving forces", and thereby brings rains and the sunshine as the friend of mankind. His importance diminishes in the post-Vedic Indian literature where he is depicted as a powerful hero but one who is getting in trouble with his drunken, hedonistic and adulterous ways, and the god who disturbs Hindu monks as they meditate because he fears self-realized human beings may become more powerful than him. Indra rules over the much sought Devas realm of rebirth within the Samsara doctrine of Buddhist traditions. However, like the Hindu texts, Indra also is a subject of ridicule and reduced to a figurehead status in Buddhist texts, shown as a god that suffers rebirth and redeath. In the Jainism traditions, like Buddhism and Hinduism, Indra is the king of gods and a part of Jain rebirth cosmology. He is also the god who appears with his wife Indrani to celebrate the auspicious moments in the life of a Jain Tirthankara, an iconography that suggests the king and queen of gods reverentially marking the spiritual journey of a Jina. Indra's iconography shows him wielding a lightning thunderbolt known as Vajra, riding on a white elephant known as Airavata. In Buddhist iconography the elephant sometimes features three heads, while Jaina icons sometimes show the elephant with five heads. Sometimes a single elephant is shown with four symbolic tusks. Indra's heavenly home is on or near Mount Meru (also called Sumeru). Indra appears in ancient works or art, and is known by many names. Top: 2nd century CE Buddhist relief from Loriyan Tangai, Gandhara, showing Indra paying homage to the Buddha at the Indrasala Cave. Bottom: Hindu gods Surya and Indra guarding the entrance of the 1st century BCE Buddhist Cave 19 at Bhaja Caves (Maharashtra). root ind-u, or "rain drop", based on the Vedic mythology that he conquered rain and brought it down to earth. root ind, or "equipped with great power". This was proposed by Vopadeva. root idh or "kindle", and ina or "strong". root indha, or "igniter", for his ability to bring light and power (indriya) that ignites the vital forces of life (prana). This is based on Shatapatha Brahmana. root idam-dra, or "It seeing" which is a reference to the one who first perceived the self-sufficient metaphysical Brahman. This is based on Aitareya Upanishad. roots in ancient Indo-European, Indo-Aryan deities. For example, states John Colarusso, as a reflex of proto-Indo-European *h₂nḗr-, Greek anēr, Sabine nerō, Avestan nar-, Umbrian nerus, Old Irish nert, Ossetic nart, and others which all refer to "most manly" or "hero". Colonial era scholarship proposed that Indra shares etymological roots with Zend Andra derived from Old High German Antra, or Jedru of Old Slavonic, but Max Muller critiqued these proposals as untenable. Later scholarship has linked Vedic Indra to the European Aynar (the Great One), Abaza, Ubykh and Innara of Hittite mythology. Colarusso suggests a Pontic[note 1] origin and that both the phonology and the context of Indra in Indian religions is best explained from Indo-Aryan roots and a Circassian etymology (i.e. *inra). He is known in Burmese as သိကြားမင်း, pronounced [ðadʑá mɪ́ɴ]; in Thai as พระอินทร์ Phra In, in Khmer as ព្រះឥន្ទ្រា pronounced [preah ʔəntraa], in Malay as Indera, in Javanese as ꦧꦛꦫꦲꦶꦤ꧀ꦢꦿ Bathara Indra, in Kannada as ಇಂದ್ರ Indra, in Telugu as ఇంద్రుడు Indrudu or Indra in Malayalam as ഇന്ദ്രൻ Indran, in Tamil as இந்திரன் Inthiran, Chinese as 帝释天 Dìshìtiān, and in Japanese as 帝釈天 Taishakuten. Indra has many epithets in the Indian religions, notably Śakra (शक्र, powerful one), Vṛṣan (वृषन्, mighty), Vṛtrahan (वृत्रहन्, slayer of Vṛtra), Meghavāhana (मेघवाहन, he whose vehicle is cloud), Devarāja (देवराज, king of deities), Devendra (देवेन्द्र, the lord of deities), Surendra (सुरेन्द्र, chief of deities), Svargapati (स्वर्गपति, the lord of heaven), Vajrapāṇī (वज्रपाणि, he who has thunderbolt (Vajra) in his hand) and Vāsava (वासव, lord of Vasus). Indra is of ancient but unclear origin. Aspects of Indra as a deity are cognate to other Indo-European gods; they are either thunder gods such as Thor, Perun, and Zeus who share parts of his heroic mythologies, act as king of gods, and all are linked to "rain and thunder". The similarities between Indra of Hindu mythologies and of Thor of Nordic and Germanic mythologies are significant, states Max Muller. Both Indra and Thor are storm gods, with powers over lightning and thunder, both carry hammer or equivalent, for both the weapon returns to their hand after they hurl it, both are associated with bulls in the earliest layer of respective texts, both use thunder as a battle-cry, both are heroic leaders, both protectors of mankind, both are described with legends about "milking the cloud-cows", both are benevolent giants, gods of strength, of life, of marriage and the healing gods, both are worshipped in respective texts on mountains and in forests. Michael Janda suggests that Indra has origins in the Indo-European *trigw-welumos [or rather *trigw-t-welumos] "smasher of the enclosure" (of Vritra, Vala) and diye-snūtyos "impeller of streams" (the liberated rivers, corresponding to Vedic apam ajas "agitator of the waters"). Brave and heroic Innara or Inra, which sounds like Indra, is mentioned among the gods of the Mitanni, a Hurrian-speaking people of Hittite region. Indra as a deity had a presence in northeastern Asia minor, as evidenced by the inscriptions on the Boghaz-köi clay tablets dated to about 1400 BCE. This tablet mentions a treaty, but its significance is in four names it includes reverentially as Mi-it-ra, U-ru-w-na, In-da-ra and Na-sa-at-ti-ia. These are respectively, Mitra, Varuna, Indra and Nasatya-Asvin of the Vedic pantheon as revered deities, and these are also found in Avestan pantheon but with Indra and Naonhaitya as demons. This at least suggests that Indra and his fellow deities were in vogue in South Asia and Asia minor by about mid 2nd-millennium BCE. Indra is praised as the highest god in 250 hymns of the Rigveda – a Hindu scripture dated to have been composed sometime between 1700 and 1100 BCE. He is co-praised as the supreme in another 50 hymns, thus making him one of the most celebrated Vedic deities. He is also mentioned in ancient Indo-Iranian literature, but with a major inconsistency when contrasted with the Vedas. In the Vedic literature, Indra is a heroic god. In the Avestan (ancient, pre-Islamic Iranian) texts such as Vd. 10.9, Dk. 9.3 and Gbd 27.6-34.27, Indra – or accurately Andra – is a gigantic demon who opposes truth. [note 2] In the Vedic texts, Indra kills the archenemy and demon Vritra who threatens mankind. In the Avestan texts, Vritra is not found. Many of the qualities of Indo-Iranian god of might/victory, Verethraghna, were transferred to the god Indra, who became the central deity of the developing Old Indic culture. Indra was the subject of 250 hymns, a quarter of the Rig Veda. He was associated more than any other deity with Soma, a stimulant drug (perhaps derived from Ephedra) probably borrowed from the BMAC religion. His rise to prominence was a peculiar trait of the Old Indic speakers. Indra is typically featured as a guardian deity on the east side of a Hindu temple. Indra was a prominent deity in the Vedic era of Hinduism. The hymns of Rigveda declare him to be the "king that moves and moves not", the friend of mankind who holds the different tribes on earth together. In one interpretation by Oldenberg, the hymns are referring to the snaking thunderstorm clouds that gather with bellowing winds (Vritra), Indra is then seen as the storm god who intervenes in these clouds with his thunderbolts, which then release the rains nourishing the parched land, crops and thus humanity. In another interpretation by Hillebrandt, Indra is a symbolic sun god (Surya) and Vritra is a symbolic winter-giant (historic mini cycles of ice age, cold) in the earliest, not the later, hymns of Rigveda. The Vritra is an ice-demon of colder central Asia and northern latitudes, who holds back the water. Indra is the one who releases the water from the winter demon, an idea that later metamorphosed into his role as storm god. According to Griswold, this is not a completely convincing interpretation, because Indra is simultaneously a lightning god, a rain god and a river-helping god in the Vedas. Further, the Vritra demon that Indra slew is best understood as any obstruction, whether it be clouds that refuse to release rain or mountains or snow that hold back the water. Even though Indra is declared as the king of gods in some verses, there is no consistent subordination of other gods to Indra. In Vedic thought, all gods and goddesses are equivalent and aspects of the same eternal abstract Brahman, none consistently superior, none consistently inferior. All gods obey Indra, but all gods also obey Varuna, Vishnu, Rudra and others when the situation arises. Further, Indra also accepts and follows the instructions of Savitr (solar deity). Indra, like all Vedic deities, is a part of henotheistic theology of ancient India. Indra is not a visible object of nature in the Vedic texts, nor is he a personification of any object, but that agent which causes the lightning, the rains and the rivers to flow. His myths and adventures in the Vedic literature are numerous, ranging from harnessing the rains, cutting through mountains to help rivers flow, helping land becoming fertile, unleashing sun by defeating the clouds, warming the land by overcoming the winter forces, winning the light and dawn for mankind, putting milk in the cows, rejuvenating the immobile into something mobile and prosperous, and in general, he is depicted as removing any and all sorts of obstacles to human progress. The Vedic prayers to Indra, states Jan Gonda, generally ask "produce success of this rite, throw down those who hate the materialized Brahman". The ancient Aitareya Upanishad equates Indra, along with other deities, with Atman (soul, self) in the Vedanta's spirit of internalization of rituals and gods. It begins with its cosmological theory in verse 1.1.1 by stating that, "in the beginning, Atman, verily one only, was here - no other blinking thing whatever; he bethought himself: let me now create worlds". This soul, which the text refers to as Brahman as well, then proceeds to create the worlds and beings in those worlds wherein all Vedic gods and goddesses such as sun-god, moon-god, Agni and other divinities become active cooperative organs of the body. The Atman thereafter creates food, and thus emerges a sustainable non-sentient universe, according to the Upanishad. The eternal Atman then enters each living being making the universe full of sentient beings, but these living beings fail to perceive their Atman. The first one to see the Atman as Brahman, asserts the Upanishad, said, "idam adarsha or "I have seen It". Others then called this first seer as Idam-dra or "It-seeing", which over time came to be cryptically known as "Indra", because, claims Aitareya Upanishad, everyone including the gods like short nicknames. The passing mention of Indra in this Upanishad, states Alain Daniélou, is a symbolic folk etymology. The section 3.9 of the Brihadaranyaka Upanishad connects Indra to thunder, thunderbolt and release of waters. In section 5.1 of the Avyakta Upanishad, Indra is praised as he who is embodies the qualities of all gods. 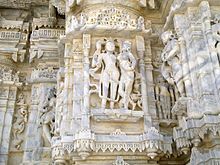 In post-Vedic texts, Indra is depicted as an intoxicated hedonistic god, his importance declines, and he evolves into a minor deity in comparison to others in the Hindu pantheon, such as Shiva, Vishnu, or Devi. In Hindu texts, Indra is some times known as an aspect (avatar) of Shiva. He is depicted as the father of Vali in the Ramayana and Arjuna in the Mahabharata. He becomes a source of nuisance rains in the Puranas, out of anger and with an intent to hurt mankind. But, Krishna as an avatar of Vishnu, comes to the rescue by lifting Mount Govardhana on his fingertip, and letting mankind shelter under the mountain till Indra exhausts his anger and relents. Also, according to Mahabharata Indra, disguised himself as a Brahmin approached Karna and asked for his kavach and kundal as a charity. Although being aware of his true identity, Karna peeled off his kavach and kundal and fulfilled the wish of Indra. Pleased by this act Indra gifted Karna a dart called Vasavi Shakthi. Sangam literature of the Tamil language contains more stories about Indra by various authors. In Silapathikaram Indra is described as Maalai venkudai mannavan (மாலைவெண் குடை மன்னவன்), literally meaning Indra with the pearl-garland and white umbrella. The Sangam literature also describes Indhira Vizha (festival for Indra), the festival for want of rain, celebrated for one full month starting from the full moon in Ootrai (later name – Cittirai) and completed on the full moon in Puyaazhi (Vaikaasi) (which coincides with Buddhapurnima). It is described in the epic Cilapatikaram in detail. In the Hindu religion, he is married to Shachi, also known as Indrani or Pulomaja. Indra and Shachi have two sons: Chitragupta and Jayanta; and two daughters: Jayanti and Devasena. Goddess Jayanti is the spouse of Shukra, while Goddess Devasena marries the war-god Kartikeya. In the Brahmavaivarta Purana, Indra defeats Vṛtrá and releases the waters. Indra asks Vishvakarma to build him a palace, but ultimately decides to leave his life of luxury to become a hermit and seek wisdom. Horrified, Indra's wife Shachi asks the priest Brihaspati to change her husband's mind. He teaches Indra to see the virtues of both the spiritual life and the worldly life. Thus, at the end of the story, Indra learns how to pursue wisdom while still fulfilling his kingly duties. Indra's iconography shows him holding a thunderbolt or Vajra and a sword. In addition he is shown on top of his elephant Airavata, which reinforces his characteristic of King of the Gods. May the strong Heaven make thee the Strong wax stronger: Strong, for thou art borne by thy two strong Bay Horses. So, fair of cheek, with mighty chariot, mighty, uphold us, strong-willed, thunder armed, in battle. Indra's weapon, which he used to kill evil Vritra, is the Vajra or thunderbolt. Other alternate iconographic symbolism for him includes a bow (sometimes as a colorful rainbow), a sword, a net, a noose, a hook, or a conch. The thunderbolt of Indra is called Bhaudhara. In the post-Vedic period, he rides a large, four-tusked white elephant called Airavata. In sculpture and relief artworks in temples, he typically sits on an elephant or is near one. When he is shown to have two, he holds the Vajra and a bow. In the Shatapatha Brahmana and in Shaktism traditions, Indra is stated to be same as goddess Shodashi (Tripura Sundari), and her iconography is described similar to those of Indra. The rainbow is called Indra's Bow (Sanskrit: indradhanus इन्द्रधनुस्). The Buddhist cosmology places Indra above Mount Sumeru, in Trayastrimsha heaven. He resides and rules over one of the six realms of rebirth, the Devas realm of Saṃsāra, that is widely sought in the Buddhist tradition. [note 4] Rebirth in the realm of Indra is a consequence of very good Karma (Pali: kamma) and accumulated merit during a human life. In Buddhism, Indra is commonly called by his other name, Śakra or Sakka, ruler of the Trāyastriṃśa heaven. Śakra is sometimes referred to as Devānām Indra or "Lord of the Devas". Buddhist texts also refer to Indra by numerous names and epithets, as is the case with Hindu and Jain texts. For example, Asvaghosha's Buddhacarita in different sections refers to Indra with terms such as "the thousand eyed", Puramdara, Lekharshabha, Mahendra, Marutvat, Valabhid and Maghavat. Elsewhere, he is known as Devarajan (literally, "the king of gods"). These names reflect a large overlap between Hinduism and Buddhism, and the adoption of many Vedic terminology and concepts into Buddhist thought. Even the term Śakra, which means "mighty", appears in the Vedic texts such as in hymn 5.34 of the Rigveda. In Theravada Buddhism Indra is referred to as Indā in Evening Chanting such as the Udissanādiṭṭhānagāthā (Iminā). The Buddha (middle) is flanked by Brahma (left) and Indra, possibly the oldest surviving Buddhist artwork. The Bimaran Casket made of gold inset with garnet, dated to be around 60 CE, but some proposals dating it to the 1st century BCE, is among the earliest archaeological evidences available that establish the importance of Indra in Buddhist mythology. The artwork shows the Buddha flanked by gods Brahma and Indra. In China, Korea, and Japan, he is known by the characters 帝釋天 (Chinese: 釋提桓因, pinyin: shì dī huán yīn, Korean: "Je-seok-cheon" or 桓因 Hwan-in, Japanese: "Tai-shaku-ten", kanji: 帝釈天). In Japan, Indra always appears opposite Brahma (梵天, Japanese: "Bonten") in Buddhist art. Brahma and Indra are revered together as protectors of the historical Buddha (Chinese: 釋迦, kanji: 釈迦, also known as Shakyamuni), and are frequently shown giving the infant Buddha his first bath. Although Indra is often depicted like a bodhisattva in the Far East, typically in Tang dynasty costume, his iconography also includes a martial aspect, wielding a thunderbolt from atop his elephant mount. Many official seals in southeast Asia feature Indra. Above: seal of Bangkok, Thailand. In the Huayan school of Buddhism and elsewhere, the image of Indra's net is a metaphor for the emptiness of all things. In Japan, Indra is one of the twelve Devas, as guardian deities, who are found in or around Buddhist temples (Jūni-ten, 十二天). In Japan, Indra has been called "Taishaku-ten". He joins these other eleven Devas of Buddhism, found in Japan and other parts of southeast Asia: Indra (Taishaku-ten), Agni (Ka-ten), Yama (Enma-ten), Nirrti (Rasetsu-ten), Vayu (Fu-ten), Ishana (Ishana-ten), Kubera (Tamon-ten), Varuna (Sui-ten), Brahma (Bon-ten), Prithvi (Chi-ten), Surya (Nit-ten), Chandra (Gat-ten). Right: Indra, Indrani with elephant at the 9th-century Mirpur Jain Temple in Rajasthan (rebuilt 15th-century). Indra in Jain mythology always serves the Tirthankara teachers. Indra most commonly appears in stories related to Tirthankaras, in which Indra himself manages and celebrates the five auspicious events in that Tirthankara's life, such as Chavan kalyanak, Janma kalyanak, Diksha kalyanak, Kevala Jnana kalyanak, and moksha kalyanak. In south Indian Digambara Jaina community, Indra is also the title of hereditary priests who preside over Jain temple functions. ^ In deities that are similar to Indra in the Hittite and European mythologies, he is also heroic. ^ The Trimurti idea of Hinduism, states Jan Gonda, "seems to have developed from ancient cosmological and ritualistic speculations about the triple character of an individual god, in the first place of Agni, whose births are three or threefold, and who is threefold light, has three bodies and three stations". Other trinities, beyond the more common "Brahma, Vishnu, Shiva", mentioned in ancient and medieval Hindu texts include: "Indra, Vishnu, Brahmanaspati", "Agni, Indra, Surya", "Agni, Vayu, Aditya", "Mahalakshmi, Mahasarasvati, and Mahakali", and others. ^ Scholars note that better rebirth, not nirvana, has been the primary focus of a vast majority of lay Buddhists. This is sought in the Buddhist traditions through merit accumulation and good kamma. ^ Dalal, Roshen. Hinduism: an Alphabetical Guide. Penguin Books, 2014, books.google.com/books?id=zrk0AwAAQBAJ&pg=PT561&lpg=PT561&dq=indraloka+hinduism&source=bl&ots=n_TDE8_SQn&sig=b4a5vg6wUlkqPxwC5mfJkeHKP5A&hl=en&sa=X&ved=2ahUKEwjOvPTWl7zbAhWKr1kKHXUzAUoQ6AEwEnoECAMQAQ#v=onepage&q=indraloka%20hinduism&f=false. ^ "Dictionary | Buddhistdoor". www.buddhistdoor.net. Retrieved 18 January 2019. ^ a b Helen Josephine Baroni (2002). The Illustrated Encyclopedia of Zen Buddhism. The Rosen Publishing Group. p. 153. ISBN 978-0-8239-2240-6. ^ Lisa Owen (2012). Carving Devotion in the Jain Caves at Ellora. BRILL Academic. p. 25. ISBN 90-04-20629-9. ^ a b c Cite error: The named reference Berry1996p20 was invoked but never defined (see the help page). ^ T. N. Madan (2003). The Hinduism Omnibus. Oxford University Press. p. 81. ISBN 978-0-19-566411-9. ^ Sukumari Bhattacharji (2015). The Indian Theogony. Cambridge University Press. pp. 280–281. ^ "War and Religion: An Encyclopedia of Faith and Conflict [3 volumes] - Google Książki". ^ Edward Delavan Perry, "Indra in the Rig-Veda". Journal of the American Oriental Society. 11.1885: 121. JSTOR 592191. ^ Jan Gonda (1989). The Indra Hymns of the Ṛgveda. Brill Archive. p. 3. ISBN 90-04-09139-4. ^ Hervey De Witt Griswold (1971). The Religion of the Ṛigveda. Motilal Banarsidass. pp. 177–180. ISBN 978-81-208-0745-7. ^ a b c d e f g h i Alain Daniélou (1991). The Myths and Gods of India: The Classic Work on Hindu Polytheism from the Princeton Bollingen Series. Inner Traditions. pp. 108–109. ISBN 978-0-89281-354-4. ^ a b c Robert E. Buswell Jr.; Donald S. Lopez Jr. (2013). The Princeton Dictionary of Buddhism. Princeton University Press. pp. 739–740. ISBN 978-1-4008-4805-8. ^ Naomi Appleton (2014). Narrating Karma and Rebirth: Buddhist and Jain Multi-Life Stories. Cambridge University Press. pp. 50, 98. ISBN 978-1-139-91640-0. ^ a b c d e Kristi L. Wiley (2009). The A to Z of Jainism. Scarecrow Press. p. 99. ISBN 978-0-8108-6821-2. ^ John E. Cort (22 March 2001). Jains in the World: Religious Values and Ideology in India. Oxford University Press. pp. 161–162. ISBN 978-0-19-803037-9. ^ T. A. Gopinatha Rao (1993). Elements of Hindu iconography. Motilal Banarsidass. p. 111. ISBN 978-81-208-0878-2. ^ Wilkings 1882, p. 52. ^ Sita Pieris; Ellen Raven (2010). ABIA: South and Southeast Asian Art and Archaeology Index: Volume Three – South Asia. BRILL Academic. p. 232. ISBN 90-04-19148-8. ^ a b c d Friedrich Max Müller (1903). Anthropological Religion: The Gifford Lectures Delivered Before the University of Glasgow in 1891. Longmans Green. pp. 395–398. ^ a b c d e Hervey De Witt Griswold (1971). The Religion of the Ṛigveda. Motilal Banarsidass. pp. 177–178 with footnote 1. ISBN 978-81-208-0745-7. ^ Edward Delavan Perry (1885). "Indra in the Rig-Veda". 11. Journal of the American Oriental Society: 121. JSTOR 592191. ^ Annette Wilke; Oliver Moebus (2011). Sound and Communication: An Aesthetic Cultural History of Sanskrit Hinduism. Walter de Gruyter. pp. 418 with footnote 148. ISBN 978-3-11-024003-0. ^ a b c d e f John Colarusso (2014). Nart Sagas from the Caucasus: Myths and Legends from the Circassians, Abazas, Abkhaz, and Ubykhs. Princeton University Press. p. 329. ISBN 978-1-4008-6528-4. ^ Shan M. M. Winn (1995). Heaven, Heroes, and Happiness: The Indo-European Roots of Western Ideology. University Press of America. pp. 371 note 1. ISBN 978-0-8191-9860-0. ^ Uma Chakraborty (1997). Indra and Other Vedic Deities: A Euhemeristic Study. DK Printworld. pp. 91, 220. ISBN 978-81-246-0080-1. ^ Presidential Address W. H. D. Rouse Folklore, Vol. 18, No. 1 (Mar., 1907), pp. 12-23: "King of the Gods is Sakka, or Indra"
^ Wilkings 1882, p. 53. ^ Alexander Stuart Murray (1891). Manual of Mythology: Greek and Roman, Norse, and Old German, Hindoo and Egyptian Mythology, 2nd Edition. C. Scribner's sons. pp. 329–331. ^ Friedrich Max Müller (1897). Contributions to the Science of Mythology. Longmans Green. pp. 744–749. ^ Michael Janda (2000). Eleusis: Das Indogermanische Erbe Der Mysterien. Institut für Sprachwissenschaft der Universität Innsbruck. pp. 261–262. ISBN 978-3-85124-675-9. ^ Eva Von Dassow (2008). State and Society in the Late Bronze Age. University Press of Maryland. pp. 77, 85–86. ISBN 978-1-934309-14-8. ^ Edward James Rapson (1955). The Cambridge History of India. Cambridge University Press. pp. 320–321. GGKEY:FP2CEFT2WJH. ^ a b Friedrich Max Müller (1897). Contributions to the Science of Mythology. Longmans Green. pp. 756–759. ^ a b Anthony 2007, p. 462. ^ a b Beckwith 2009, p. 32. ^ Anthony 2007, p. 454-455. ^ Anthony 2007, p. 454. ^ a b c d Alain Daniélou (1991). The Myths and Gods of India: The Classic Work on Hindu Polytheism from the Princeton Bollingen Series. Inner Traditions. pp. 106–107. ISBN 978-0-89281-354-4. ^ Hervey De Witt Griswold (1971). The Religion of the Ṛigveda. Motilal Banarsidass. p. 178. ISBN 978-81-208-0745-7. ^ Hervey De Witt Griswold (1971). The Religion of the Ṛigveda. Motilal Banarsidass. p. 180, verse 1.32.15. ISBN 978-81-208-0745-7. ^ a b c Hervey De Witt Griswold (1971). The Religion of the Ṛigveda. Motilal Banarsidass. pp. 180–183 with footnotes. ISBN 978-81-208-0745-7. ^ Arthur Berriedale Keith (1925). The Religion and Philosophy of the Veda and Upanishads. Motilal Banarsidass. pp. 93–94. ISBN 978-81-208-0645-0. ^ Friedrich Max Müller (1897). Contributions to the Science of Mythology. Longmans Green. p. 758. ^ Friedrich Max Müller (1897). Contributions to the Science of Mythology. Longmans Green. p. 757. ^ Jan Gonda (1989). The Indra Hymns of the Ṛgveda. Brill Archive. pp. 4–5. ISBN 90-04-09139-4. ^ Jan Gonda (1989). The Indra Hymns of the Ṛgveda. Brill Archive. p. 12. ISBN 90-04-09139-4. ^ Friedrich Max Müller (1897). Contributions to the Science of Mythology. Longmans Green. p. 827. ^ Friedrich Max Müller (1897). Contributions to the Science of Mythology. Longmans Green. p. 828. ^ a b c Paul Deussen (1997). A Sixty Upanishads Of The Veda, Volume 1. Motilal Banarsidass. pp. 15–18. ISBN 978-81-208-0430-2. ^ Johannes Bronkhorst (2007). Greater Magadha: Studies in the Culture of Early India. BRILL. p. 128. ISBN 90-04-15719-0. ^ Patrick Olivelle (1998). The Early Upanishads: Annotated Text and Translation. Oxford University Press. p. 20. ISBN 978-0-19-535242-9. ^ S Krishnamoorthy (2011). Silappadikaram. Bharathi Puthakalayam. ^ S Krishnamoorthy (2011). Silappadikaram. Bharathi Puthakalayam. pp. 31–36. ^ Roshen Dalal (2010). The Religions of India: A Concise Guide to Nine Major Faiths. Penguin Books India. pp. 190, 251. ISBN 978-0-14-341517-6. ^ a b Alain Daniélou (1991). The Myths and Gods of India: The Classic Work on Hindu Polytheism from the Princeton Bollingen Series. Inner Traditions. pp. 110–111. ISBN 978-0-89281-354-4. ^ Gopal, Madan (1990). K.S. Gautam (ed.). India through the ages. Publication Division, Ministry of Information and Broadcasting, Government of India. p. 75. ^ (Masson-Oursel and Morin, 326). ^ Alain Daniélou (1991). The Myths and Gods of India: The Classic Work on Hindu Polytheism from the Princeton Bollingen Series. Inner Traditions. p. 278. ISBN 978-0-89281-354-4. ^ Trainor 2004, p. 62. ^ Merv Fowler (1999). Buddhism: Beliefs and Practices. Sussex Academic Press. p. 65. ISBN 978-1-898723-66-0. , Quote: "For a vast majority of Buddhists in Theravadin countries, however, the order of monks is seen by lay Buddhists as a means of gaining the most merit in the hope of accumulating good karma for a better rebirth." ^ Christopher Gowans (2004). Philosophy of the Buddha: An Introduction. Routledge. p. 169. ISBN 978-1-134-46973-4. ^ Robert E. Buswell Jr.; Donald S. Lopez Jr. (2013). The Princeton Dictionary of Buddhism. Princeton University Press. pp. 230–231. ISBN 978-1-4008-4805-8. ^ John Clifford Holt; Jacob N. Kinnard; Jonathan S. Walters (2012). Constituting Communities: Theravada Buddhism and the Religious Cultures of South and Southeast Asia. State University of New York Press. pp. 45–46, 57–64, 108. ISBN 978-0-7914-8705-1. ^ E. B. Cowell & Francis A. Davis 1969, pp. 5, 21. ^ E. B. Cowell & Francis A. Davis 1969, p. 44. ^ E. B. Cowell & Francis A. Davis 1969, p. 71 footnote 1. ^ E. B. Cowell & Francis A. Davis 1969, p. 205. ^ Robert E. Buswell Jr.; Donald S. Lopez Jr. (2013). The Princeton Dictionary of Buddhism. Princeton University Press. p. 235. ISBN 978-1-4008-4805-8. English Translation: HH Wilson (1857). Rig-veda Sanhita: A Collection of Ancient Hindu Hymns. Trübner & Company. pp. 288–291, 58–61. ^ "Part 2 - Evening Chanting". www.Watpasantidhamma.org. Retrieved 18 January 2019. ^ a b Donald S. Lopez Jr. (2013). From Stone to Flesh: A Short History of the Buddha. University of Chicago Press. p. 37. ISBN 978-0-226-49321-3. ^ "กรุงเทพมหานคร". Royal Institute Newsletter. 3 (31). December 1993. Reproduced in กรุงเทพมหานคร [Krung Thep Mahanakhon] (in Thai). Archived from the original on 10 December 2016. Retrieved 12 September 2012. ^ Goswamy 2014, p. 245. ^ a b Lisa Owen (2012). Carving Devotion in the Jain Caves at Ellora. BRILL Academic. pp. 25–28. ISBN 90-04-20629-9. ^ Helmuth von Glasenapp (1999). Jainism: An Indian Religion of Salvation. Motilal Banarsidass. pp. 268–269. ISBN 978-81-208-1376-2. E. B. Cowell; Francis A. Davis (1969). Buddhist Mahayana Texts. Courier Corporation. ISBN 978-0-486-25552-1. Masson-Oursel, P.; Morin, Louise (1976). "Indian Mythology." In New Larousse Encyclopedia of Mythology, pp. 325–359. New York: The Hamlyn Publishing Group. Janda, M., Eleusis, das indogermanische Erbe der Mysterien (1998). Wikimedia Commons has media related to Indra.